Instead of making a Halloween wreath this year, I decided to make a painted burlap Halloween Door hanging . It's a nice change-up of my usual (yawn) door accessory. I bet the neighbors are SUPER excited (ha!). To make the door hanging, cut out a rectangle of burlap (approximately 11x14") and finish the sides by sewing a straight stitch on all 4 sides. 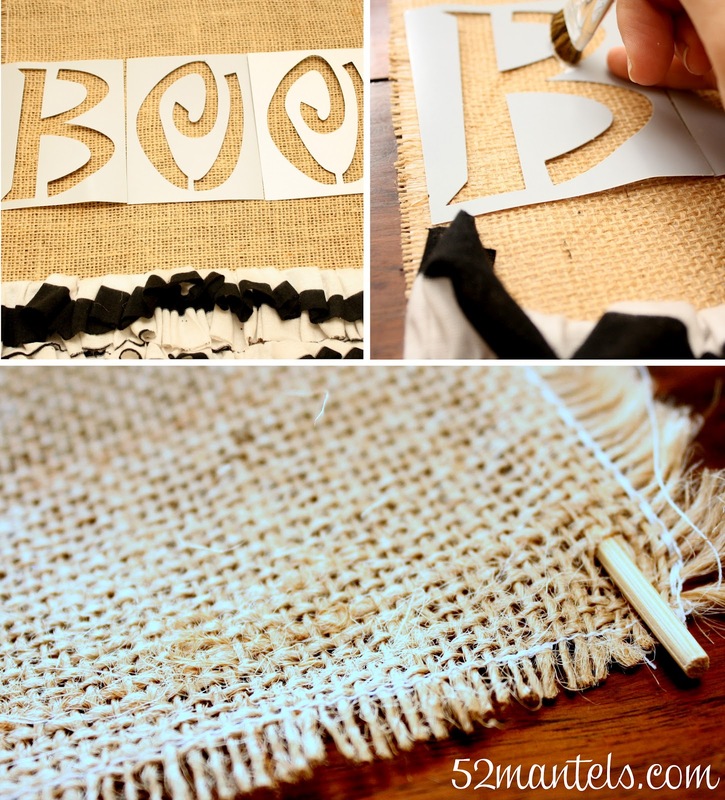 Let the burlap fray up to the stitch. Cut a piece of knit fabric into 2 strips, 4 inches x twice the width of your hanging. Sew a double-edged ruffle by stitching down the middle of your knit fabric. I'm not an expert sewer, but ruffles are super easy to make. Here's a great tutorial for them! 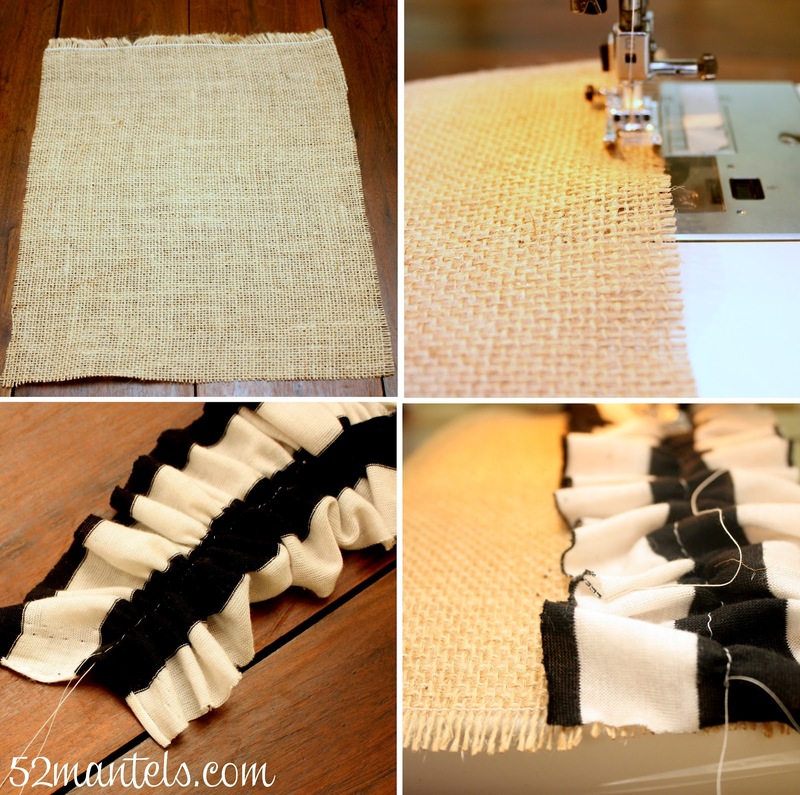 Sew your ruffles to the bottom edge of your burlap rectangle, in two rows. 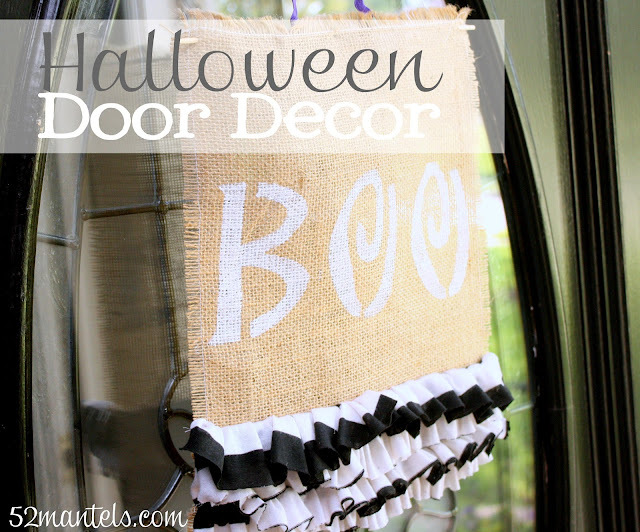 To paint the word BOO on your hanging, use a stencil found at your local craft store (or walmart, where I got my set). Carefully hold down the edges of your stencil as you stipple white paint to the center using a stiff brush. When the paint is dry, take a wooden dowel (or skewer) and insert it through the top of your hanging. The weave is loose enough that you should be able to work the dowel in through the fabric. I used a tiny bit of hot glue on the back of the hanging to keep the dowel from slipping and sliding. To hang my door decor, I tied a piece of purple ric-rac to the wooden dowel and slipped the hanging on my existing wreath hook. That's all there is to it! Easy enough for this novice sewer. That is really cute and I love the alternativeness (I know that's not a word) of it! How clever! Nice alt. I'm finding burlap to be a very versatile item to work with indeed! Absolutely darling!!! Love ruffles and burlap combo! So sweet. I want to try this. I'm your newest follower. I would love to have you as a follower too. Happy Friday. Aw I love this...nice and simple too!